The Food Bank RGV and Toys for Tots spent the day accepting donations from the public at several Rio Grande Valley locations. With the assistance of KGBT, they were able to bring in people to make their contribution. The Food Bank of the Rio Grande Valley is accepting non-perishable food for distribution to families in need this holiday. They also accept cash donations; with one dollar, the Food Bank RGV can provide five meals. 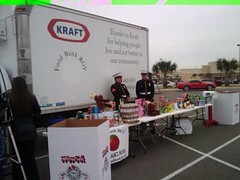 Toys for Tots accepts toys all year for their annual giveaway. However, their effort really kicks off in November as they try to meet their goal. Toys for Tots accepts new, unwrapped toys and cash donations. You can make a difference in somebody's life by giving just a little bit. One dollar can be nothing; but in some cases, one dollar means a lot. Please help this holiday season.